I had never seen a rocket launch firsthand until last week.Then I witnessed the future of American spaceflight. I had traveled down to Cape Canaveral, Fla., to cover thelaunch of the commercial space company SpaceX's Falcon9 rocket and Dragon space capsule. The spacecraft is designed to carrycargo to the International Space Station for NASA ? and eventually to carryastronauts, too. If SpaceX was successful on this test liftoff, it would bethe first time a private company launched and re-entered a spacecraft fromorbit ? an important milestone for the burgeoning commercial sector. On a more personal note, it was going to be my first timeseeing (and writing about) a rocket launch. I had come to work as a reporterfor SPACE.com in April, and in early November I was sent to NASA's KennedySpace Center to cover STS-133 ? the space shuttle Discovery's final flight. Badweather and issues with the shuttle's external fuel tank delayed the launch.So, after 10 days of biding my time at Cape Canaveral in the vain hope ofseeing a shuttle launch (it is now plannedfor early February), I flew back to New York with my most exciting personalanecdote being that one day I feared an attack by a group of vultures that hadswarmed around some bread left in the parking lot of the NASA press site. After that, my anticipation of seeing a launch was evenstronger. Plus, I was starting to get teased by some of my colleagues, whojoked that every launch I was assigned to cover seemed to eventually getscrubbed. 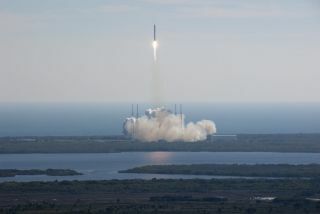 Even though I had been writing about SpaceX and othercommercial spaceflight companies for several months, the significance of the Dragonlaunch was only beginning to sink in when I returned to the Cape. At that day's press briefing, SpaceX officials said a coupleof cracks had been found on the extension of Falcon 9's second-stage enginenozzle, which would delay the launch from its target of Dec. 7. I began towonder if one reporter really could carry a launch curse. I dutifully called myhotel and rental car companies to extend my stay ? a practiced activity by now. Yet, in a remarkably quick turnaround, SpaceX engineersworked overnight on repairs, and word came down late that Tuesday that we were"go" for launch the next day ? Dec. 8. That morning, I found myself standing with a group ofreporters and photographers off the NASA Causeway as the countdown clock tickeddown the minutes and seconds until liftoff. I had been told by several veteranspace reporters that for my first launch, I should simply enjoy watching ithappen. Soak in the experience ? don't bother taking pictures, they said. So I ignored the instinct to grab my camera or live-tweetwhat I was seeing. Instead I took in every second and tried to imprint it in mymemory, so that one day I could tell my children what it felt like to bestanding roughly 4.3 miles (around 7 kilometers) away from a truly historicevent. From my vantage point, I saw the Falcon 9 engines ignite,followed by a few seconds of silence, which was the time it took for the roarof the Merlin engines to cross the water from the Cape Canaveral Air ForceStation's Launch Complex 40. I felt it first in the rumbling beneath my feet. Then, asthe rocket made its ascent and the orange flames lit up the pristine blue sky,the sound thundered through my chest. It was spectacular. I wish I could have been more eloquent in the moment, butall I could say over the phone to my editor in New York was, "Wow, thereit goes." I followed the brilliant white exhaust trail until the rocketwas a tiny speck in the sky, and then it disappeared. Judging by the reactions of the other reporters andphotographers, the giddiness of seeing a launch never goes away. I'm told,however, that nothing is quite like the first time. Seeing the Falcon 9 rocketblast into the crisp morning sky was incredible, especially knowing theimplications of the monumental test flight. In the media, we try our very best to stay away fromsensationalism, but it is not a stretch to call the success of the SpaceXlaunch the dawn of a new era. For the first demonstration flight under NASA'sCOTS (Commercial Orbital Transportation Services) program designed to spurdevelopment of private spacecraft, the stakes for SpaceX were undoubtedly high.In light of the successful mission, however, the payoff is likely even higher. If everything had gone according to plan, my first launchexperience would have been the space shuttle Discovery on its final flight tothe International Space Station. Yet, it's ironic, and somehow fitting, thatinstead I saw the vehicle that could replace the shuttles' capability in thenot-too-distant future. I'm still very much looking forward to seeing a spaceshuttle launch ? in February, I hope ? but in the meantime, I have plentyto talk about with my friends and family. And I must say I'm awfully relievedthere is no launch curse. You can follow SPACE.com Staff Writer Denise Chow onTwitter @denisechow.